Recently I published a post on TV programmes vocabulary. In this post I would like to add a few activities to help the teachers prepare a great lesson on this topic and to give students a few more activities to practise the vocabulary. Unlike in the previous posts, there are several worksheets which you can print out and use. There is a song and a gap fill, a bingo worksheet and a worksheet with five more activities to practise the vocabulary connected with TV programmes. And of course there is a mind map to help you remember the new words better. I love using songs at the beginning of a lesson. Especially if they are popular, they can serve as a great starter. If you are just a learner of English, you can try the interactive quiz below. For this lesson, I am going to use the song Throw Away your Television by Red Hot Chilli Peppers. I you need the lyrics for your classroom or a you simply prefer paper materials, here are two pdf files. What will be the lesson about? Once I get the topic of the lesson out of the students I move to the other part of the lesson. There are three ways to go about presenting vocabulary. 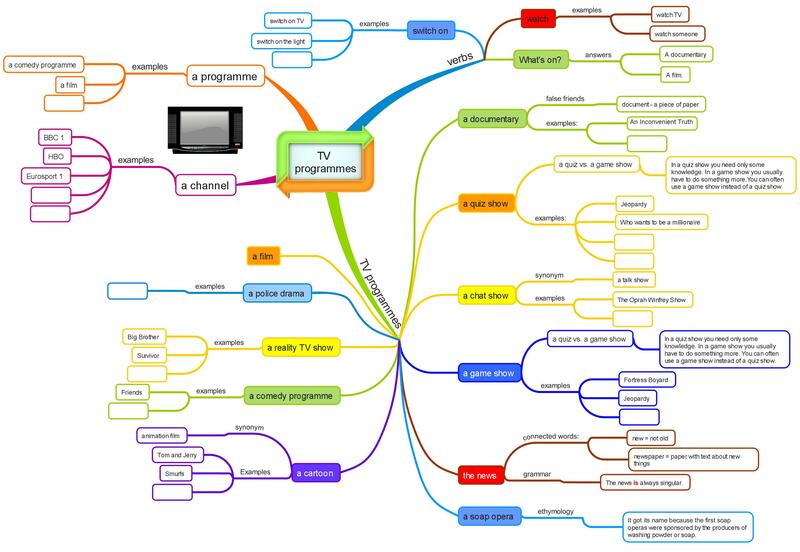 I would use the video from the previous post on TV programmes vocabulary and the following mind map. If you do not like any of the materials above, all the new vocabulary is listed in the worksheets too. If you have already presented the students with the video and a mind map, start with the second exercise. Students should put the words into the correct form and complete the sentences. Once they complete them, discuss the questions in pairs and then as a whole class. The other exercises are quite simple and quite fun. Ask the students to do as much as they can in 10 minutes. You can give them the answers at the end of the activity or you can check their answers. Once we do the worksheets, I give my students a chance to use the new words creatively. Ask them to write 3-10 questions using the new words. Help the struggling students by giving them the simple example What sports programmes do you watch? and show them that they can create 12 questions by replacing the words sports programmes with other TV programmes vocabulary. When the students write the questions give them a chance to ask you their questions. Answer the questions and at the same time you have a chance to correct the most striking mistakes. After a while ask the students to discuss the questions in pairs. At the end of the lesson I try to put a game. This time I have prepared the Bingo game for my students. Print out the following worksheet and cut it. Shuffle the cards and give each student one. Ask them to work in pairs and say the names of the TV programmes they have on their cards. They can ask you if they are not sure. If you are sure that the students know all the words there are two options for you. You can either read the words yourself or I ask each student to say one of the words. Remember to state the winning combination before you start the game. And that is the end of the lesson. If I count correctly, the lesson will take about 40 minutes.